Add these easy white cake recipes to your collection. White cakes are delicious yet simple to bake, and almost any flavor of icing or filling can be used making them versatile and extra special. They're the perfect cakes for serving on any occasion as people always love to eat them. Prepare pan. Sift flour once, measure, add baking powder, and sift together three times. Cream shortening thoroughly, add sugar gradually, and cream together until light and fluffy. Add flour, alternately, with milk, a small amount at a time. Beat after each addition until smooth. Add vanilla; fold in egg whites. Bake in two greased 9-inch layer pans in a moderate oven (375°F) for 25 to 30 minutes; or in single greased 8x8x2-inch pan, in moderate oven (350°F) for 1 hour. Double recipe to make three 10-inch layers for a triple layer cake. Frost with your favorite frosting. Cream together the butter and sugar, add flour sifted with baking powder alternately with the stiffly beaten whites of eggs. The five yolks of eggs left from baking white cake may be used when making other recipes. Scald one cup of milk and pour hot over the above mixture. Beat well. Fold into the mixture, carefully, the stiffly beaten whites of 2 eggs. Flavor with a few drops of almond extract. Bake in a moderate oven, exactly as you would bake an angel cake. This is a delicious, light, flaky cake, if directions are closely followed, but sometimes a little difficult to get just right. 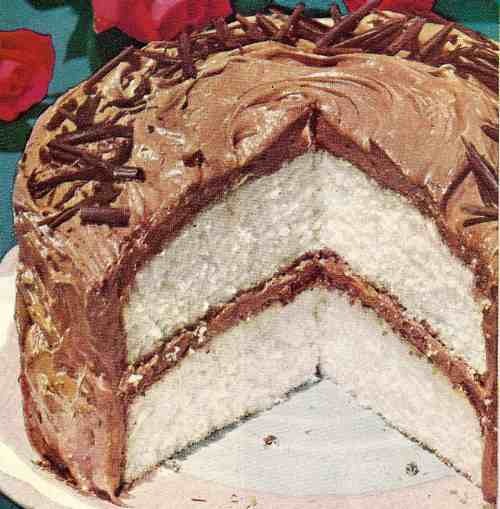 Double ingredients for layer cake. How to make a white cake: Two cups of sugar, 1/2 cup of butter; beat the butter and sugar till like cream; stir in 1 cup of sweet milk; add 3 cups of flour and 2 teaspoonfuls of baking powder; beat the whites of 5 eggs and stir in with the flour. Do NOT bake too fast. —Laughing Ora, Morris, Ill. Mix and sift baking powder and flour. Cream the butter, add the sugar gradually. Add the flour and milk alternately, then the flavoring, and lastly cut in the whites of the eggs, beaten until stiff. Bake in a moderate oven. 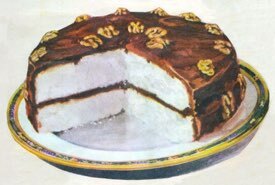 Compared to other dessert cakes that enjoy a long history, white cakes only came into being during Queen Victoria's reign. The secret to achieving the best results from white cake recipes has always been to use the finest white flour and other ingredients. 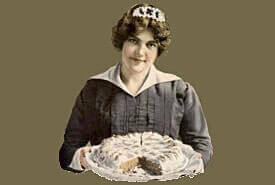 Improvements in refining methods meant that white flour and white sugar had become commonly available by the 1850s, making it possible to have cakes with the lightest color and texture. However, the extra cost of the refined ingredients meant that white cakes were mostly made for special occasions by those that could afford them. 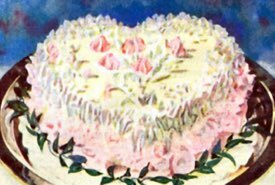 The whiteness of these dessert cakes came to symbolize purity, which accounted for their popularity at weddings, and their costlier ingredients reflected the prosperity of those serving them.